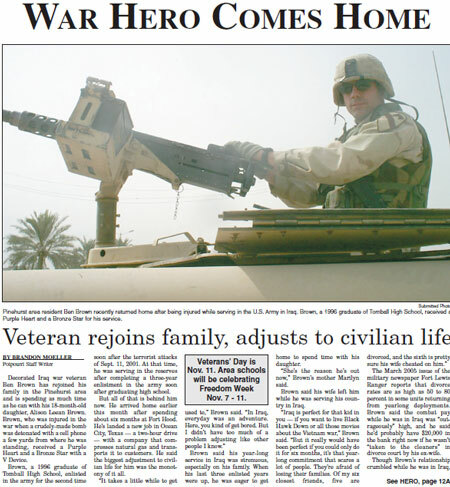 The story “War hero comes home,” published in the Nov. 2, 2005 issue of The Tomball Potpourri, won an ASP Westward Excellence in Journalism Award: Third Place, for Best Enterprise Story 2005. It is about a Tomball soldier who returns home after fighting in Iraq and the story chronicles his readjustment to civilian life. An award-winning story I wrote for the Tomball Potpourri. Decorated Iraq war veteran Ben Brown has rejoined his family in the Pinehurst area and is spending as much time as he can with his 18-month-old daughter, Alison Leean Brown. Brown, who was injured in the war when a crudely-made bomb was detonated with a cell phone a few yards from where he was standing, received a Purple Heart and a Bronze Star with a V Device. Brown, a 1996 graduate of Tomball High School, enlisted in the army for the second time soon after the terrorist attacks of Sept. 11, 2001. At that time, he was serving in the reserves after completing a three-year enlistment in the army soon after graduating high school. But all of that is behind him now. He arrived home earlier this month after spending about six months at Fort Hood. He’s landed a new job in Ocean City, Texas — a two-hour drive — with a company that compresses natural gas and transports it to customers. He said the biggest adjustment to civilian life for him was the monotony of it all.